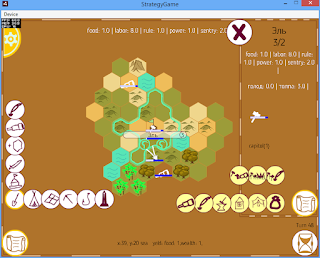 We proudly present the first playable version of our own mobile turn-based strategy. As this is the first version, without a proper tutorial, please, read this manual carefully. First you should develop your territory. Press the bottom-left button (with a scroll) and then the 2nd bottom button (with a shovel). When you tap a building button, the hexes, which allow this type of building, will be highlighted. When you tap one of the hexes, the confirmation window will appear. If you want to cancel building in progress, tap it and press (X) in the info panel. If you tap your city, the city panel will be open (to the right). You'll be able to build and upgrade your buildings, or launch the projects of direct labor conversion to other resources. The initial labot to other resources conversion rate is 10:1, but it can be increased by building and upgrading the appropriate buildings. Also on the city panel you'll see the city name, it's population level and living capacity. Then there's a list of resources produced in this province. The disaster points accumulated here. For now there are 2 disasters: hunger and overpopulation (crowd). When hunger+crowd>10*citypopulation, then one citizen leaves the city. But if you are building a colony, the "crowd" disaster points can be spent to expedite its building. When the colony is established, it will give you 10% of its resources. But this will create revolutionary thoughts there. To handle them you must create a diplomatic influence (top in the left column) project in your colony. Eventually you'll be able to integrate it fully into your empire. But beware! There are 2 AI-controlled countries in the game. They micht create a diplomcy influence project in your capital. And you'll notice nothing until one day you'll see that you are someone's sattelite. To avoid this, build obelisks and upgrade the temple. End turn button - in the bottom-right screen. corner. You can exit to the main menu via settings (top-left button) and create another map. You can set the map type and the water percentage. We will be happy to know your opinion and suggestions.